The difficulty of differential time-flow was not discovered until approximately one year after Project TRUE began making regular off-world missions. It was determined that a method of measuring time differential was needed in order to avoid complications in resupply and rendezvous with long term exploration teams. To this end, a former watchmaker employed by CSW developed a system using a gyroscopically balanced automatic scaling chronometer, refered to in his notes as the "Gyrochronautomaton." 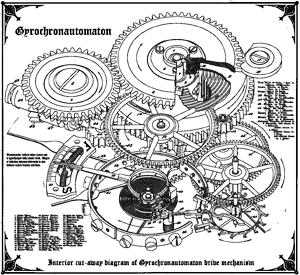 The overall system consists of a stationary base clock and a number of pocket-watch sized remote units (see cut-away diagram, attached). Most Project personel use the term "Difference Watch" to refer to a remote unit. Each individual difference watch is a highly accurate timepiece, with a built-in secondary timer. A member of each exploration team is issued a difference watch and assigned to timekeeping duty. Upon departure, the timekeeper activates the secondary timer, which tracks the amount of time spent off world. Upon return, the timer is deactivated and the difference watch is placed in a synchronizing cradle. This cradle measures the difference in the time elapsed on the remote unit and the time elapsed on the main clock to an accuracy of .01%. Any positive or negative variation is recorded as a standard part of the mission data. On any subsequent visits made to the destination, a difference watch unit will be automatically calibrated using the time data from the initial exploration mission. This device will be issued to the mission timekeeper. The difference watch will run either fast or slow, compared to subjective time, in order to display the current time showing on the base clock. This allows the remote team to accurately co-ordinate their schedules with their home base.